I’d love to say that it’s because of the rich history (that’s mainly fake, but that’s another blog post!) or that it’s a time for our family the reflect on what we’ve been so thankful for all year, but mainly it’s because food and family. That being said, Thanksgiving, and holidays in general, can get pretty tricky around here with two kids with sensory struggles. I see mashed potatoes and immediately start dreaming about my second plate, but A-Man sees them and has a near panic attack. I know that when family comes over to share a meal it’s a good thing, but A-Man gets easily overwhelmed. Cap’n M’s sensory struggles have improved a lot in the last year, so he’s able to eat most foods now. But the over-stimulation from Thanksgiving is enough to throw off his entire routine for a week or more. So what do we do? We can’t avoid all holidays forever! 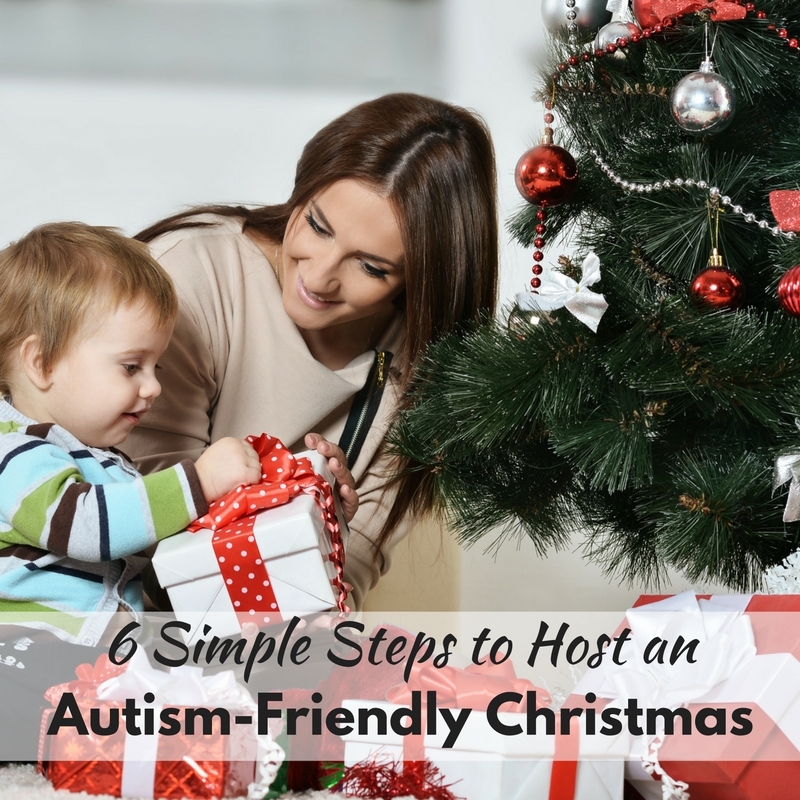 We can, however, do what we can to make our holidays as sensory friendly as we can. So today I’m sharing my top tips for surviving Thanksgiving with sensory struggles! Plan for Thanksigiving. Then Plan Some More. I kind of feel like this is a special needs mom’s mantra. We’re more prepared than girl scouts. If you know that chicken nuggets is a safe food for your child, bring it to the family meal. Even better? Bring several safe foods, because you know that the one day you rely on good old chicken nuggets your child will decide they can only eat macaroni and cheese. Trust me, bring several meal/snack type foods. In the same way, bring some activities that you know are always a hit with your kiddo. If you know that your iPad will calm your child down and avoid a huge melt down, bring it. Who cares what your Great Aunt Sally thinks about kids being too dependent on technology? She’d also complain about how “kids in her day never acted like that” if your child has a meltdown. Choose the iPad ! Other things that would be a good idea to bring are a weighted vest or blanket, a small toy as a transition object, a favorite book, noise cancelling headphones , and a carrier (we have a Tula for A-Man and an Onya for Cap’n M plus a few wraps). Will your family think that you’re moving in? Yes. Is that better than trying to handle a meltdown in a hot house full of people? Yes. Okay, I know that you think I’m crazy right about now, but bear with me. We have people to our house instead of going to other people’s houses whenever possible. In our house? A-Man has his room, his toys, his coping strategies, and his food all at his finger tips. He doesn’t have to transition to a new place with new sights, smells, and expectations. I’m not saying this will make your Thanksgiving easy, but when we had family over yesterday we only had one melt down from A-Man the entire time, and it was because someone was accidentally blocking his route to his chair at the table. I think the stress of making a Thanksgiving meal will easily outweigh the stress of transitioning a child with sensory processing disorder or autism into a new place during an overwhelming holiday every time. I’m going to assume that your friends and family know that your child has sensory struggles, but do they really know what that means? Do they know the difference between a spoiled toddler tantrum and a true sensory meltdown? Do they understand why your child may not give hugs and kisses to everyone who comes in? Do they know why they don’t quite make eye contact? These conversations can be hard, but they need to happen. Everyone can learn to accept disabilities and accommodations if they’re taught to. Now, this doesn’t need to be a big event where you sit everyone down and explain the ins and outs of sensory overload. With my nephew, it was as simple as this: “A-Man’s brain works differently than yours and Mr. C’s, so he has a harder time with some things. He doesn’t always know how to answer your questions, and sometimes he needs personal space”. No matter how you approach it, manage your family’s expectations. It will save you, and your child, a lot of headache! Okay, I shared before about how I may or may not have been called a sleep Nazi by my family before, but I’m serious, this can make or break your holiday. We had Thanksgiving at our house on a Wednesday because that’s what worked best for our family. The only issue with this was Wednesday is also the day that Mr. C and A-Man come home from their biological dad’s house, and they almost always come home exhausted. They go to bed later and get up earlier at that house so they get really tired really fast by the time they come home. Can you imagine having Thanksgiving dinner with a four year old with sensory struggles that’s been awake since 4 in the morning? Me either. I’d probably cry. Or give up. Or both. Where’s the wine? So we put the kids all down for a nap early (bonus, it gave us more kid-free time to cook!) and A-Man slept like a log. In fact, when people started arriving, he was still asleep, and we were totally fine with that. He woke up about a half hour before dinner (so that he had time to transition), snuggled me in my rocking chair for about ten minutes, laid on the couch for about ten minutes, and then was ready to go. The kids stayed up later than usual last night, and without the nap we wouldn’t have survived. Even big kids need quiet time and rest. Make sure to take rest times during holidays! I debated on what to call this section. Be Realistic? Have Grace? Consider Your Own Expectations? Ultimately I landed at Be Thankful. 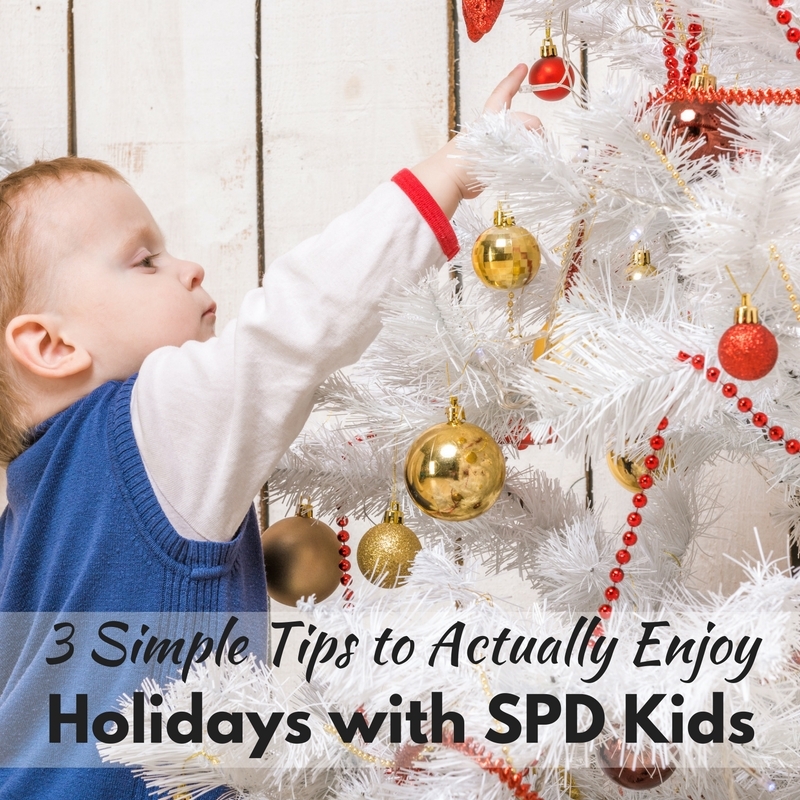 Trying to survive the holidays while navigating sensory struggles can be really, really hard. Sometimes you’ll be frustrated with your child when they just will not eat what you have for them. Sometimes you’ll be frustrated with your family when they say something they shouldn’t about autism. Sometimes you’ll be frustrated with yourself that you didn’t prepare for something, or weren’t able to prevent a meltdown. And eventually, you might just feel like curling into a ball and giving up on holidays, even if you’re a holiday fanatic like me. This time of year is hard with sensory struggles. There’s lights and music and new foods and people. 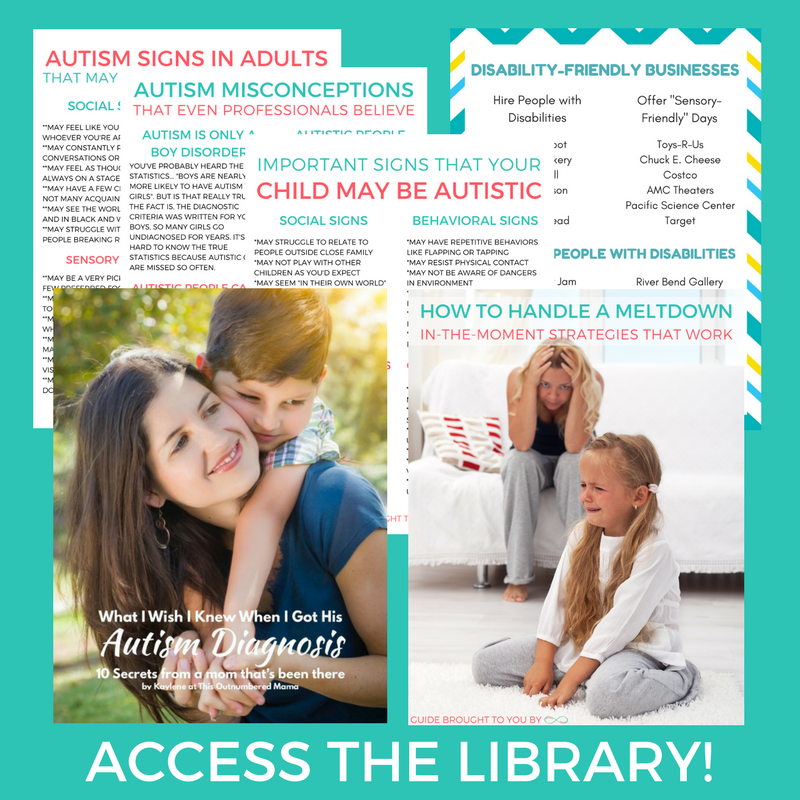 It’s overwhelming for neurotypical kids, let alone kids with sensory processing disorder or autism. Not to mention, it’s like there’s holidays or events every other week this time of year. For families that thrive on routine, it’s stressful. So yes, be realistic, have grace (for you, your child, and your family), consider your own expectations before an event, but ultimately, be thankful. Be thankful that you have such a unique little one who experiences the world in a way that many of us can never imagine. Be thankful that your little one was given to you, a mama who is willing to fight for your child to have the best holiday experience ever. Just be thankful, because while the mashed potatoes, stuffing, and pumpkin pie are fantastic, being thankful is really what Thanksgiving is all about. I don’t eat pumpkin pie. Ice cream is my preferred dessert on Thanksgiving.